Sorry about this bit, guys. 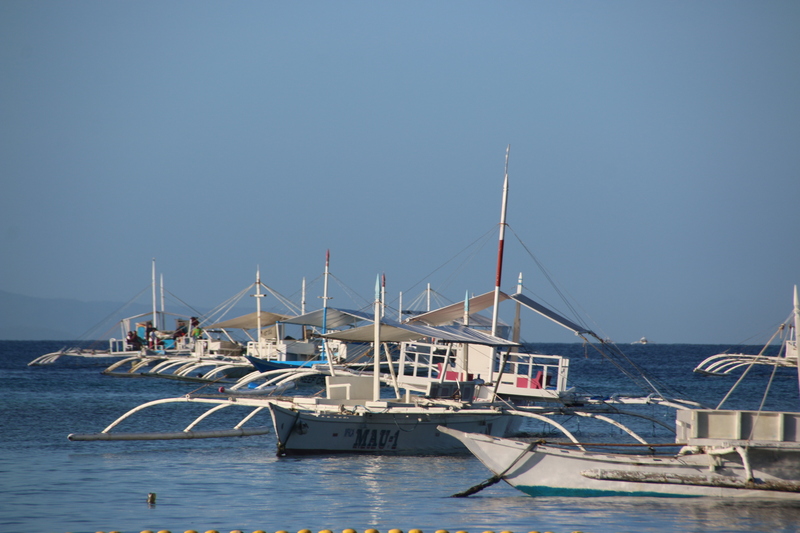 A short flight from Manila brings me to Bohol Island and the resort of Alona Beach. It’s not quite what I expected in so far as it is a beautiful coral sand beach but it is in the early stages of developmen and there are signs that its days of quiet, retro charm are limited. It reminds me of those beautiful Thai beaches, ten years ago before full on tourism and buckets of cocktails and full moon parties changed paradise forever. So still unspoilt but newer, larger hotels are being built to cater for the increased numbers of westerners and Koreans that a new airport will bring to the island. 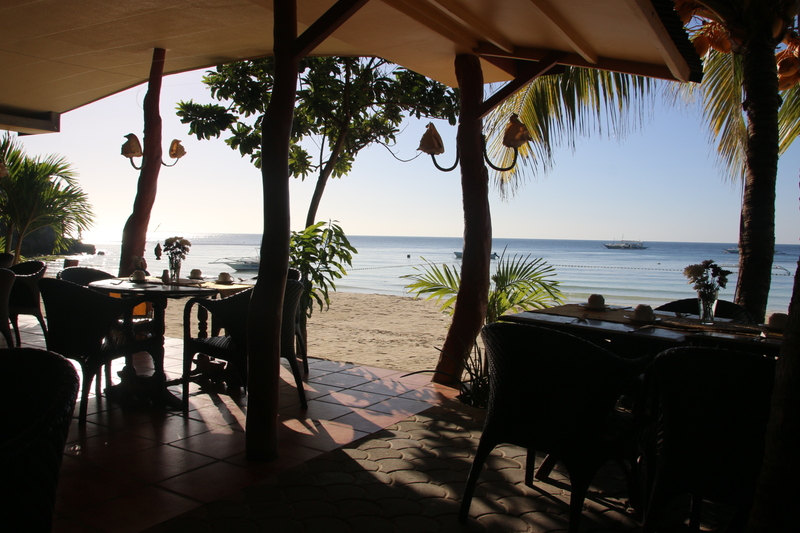 So for now take advantage of Alona Beach while it is quiet with only a handful of hotels and hostels. 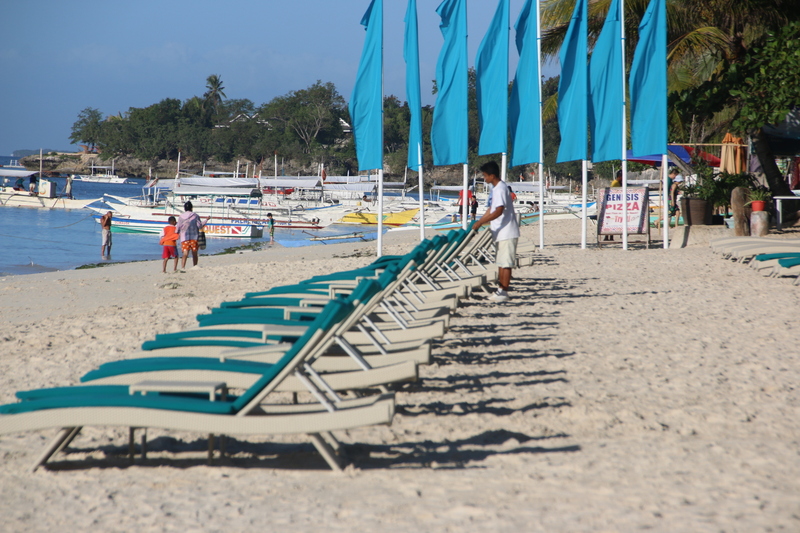 The beach is still quiet with tons of space to find chill out time in the shade of leaning pesos or to bar-b-que the tan out in the full glaze and, boy, are there some tans that have been nurtured for weeks! There are two obvious groups who strut their stuff, parading up and down the beach – young western backpackers showing of their pecks or bikinis and young Koreans showing of their beach garb to stay as covered up as possible even when swimming. 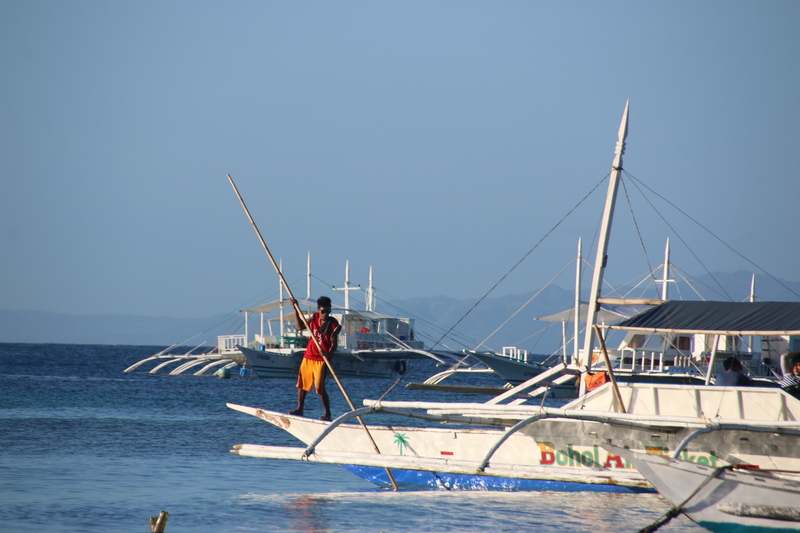 The main entertainment, after sun bathing, is going out in one of the hundreds of outriggers that ply their trade from the beach. Aloma Beach is a diving and snorkeling centre but I joined Capt. Gabriel and his passengers to visit nearby islands. It was great to get away from baking Alaska on the beach and to smack through the waves, with the wind cursing in my hair accompanied by the smell and noise of an ancient diesel engine. 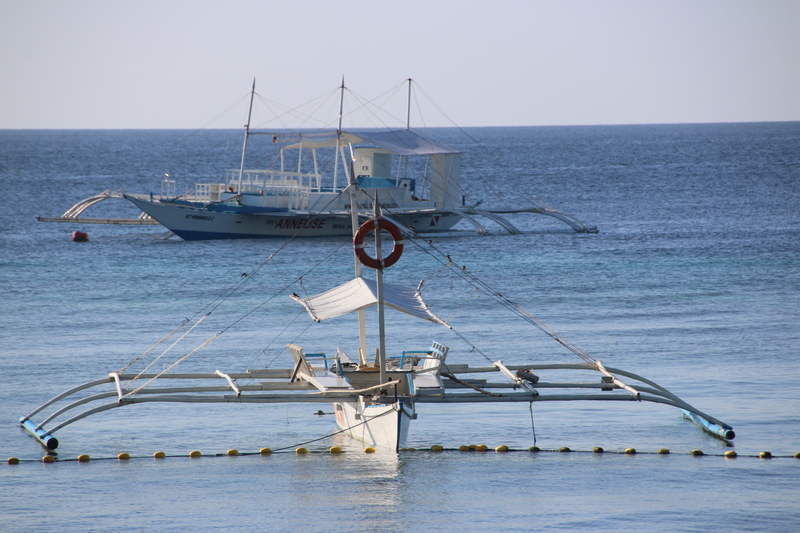 Other outriggers kept us company like crabs scuttling sideways across the ocean. The boats collect together along the coral white beaches of the islands and unload their human cargo of travellers who trot off to snorkle a line of buoys or drop off bigger crabs to dive deeper reefs or dash to the shaded to drink coke or eat grilled Jackfish or maybe wander through the blitzing sun taking in the array of craft before joining fellow travellers in the shade. I suppose I shouldn’t complain about the blazing sun, the feel of the sun on the body, the crust of salt on the skin from cooling down in the clear waters of the South China Sea, the smell of grilled fish on the bar-b. It is lovely showering off the day, lotioning up, stretching out on a bed under the air con, anticipating a beer and bite later. After all, this will be all over in a day or two and I’ll be back home with you and it will all be just a lovely warm memory. Enjoy it with me while you can.